Ricky Gervais is returning to "The Office." Ricky Gervais, one of the creators and stars of the original, British version of “The Office,” has reportedly shot a cameo for the NBC show ahead of actor Steve Carell’s exit. "It's a little more than if you blink, you'll miss it, but if you don't set your TiVo right, you'll miss it," producer Paul Liebersteintold NY Mag’s Vulture blog of Gervais’ “cold open” on Jan. 27. 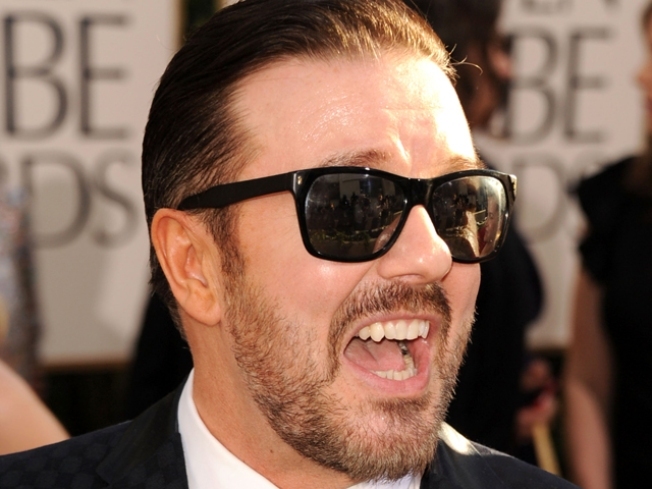 Gervais reprised his UK role as bumbling boss David Brent on camera in September, long before his controversial Golden Globes hosting performance, said Lieberstein, who plays Toby. The scene shows Gervais interacting with Carell’s character, Michael Scott, outside Dunder-Mifflin, and was intended as an unannounced tribute until news leaked, Lieberstein told Vulture. Last week, NBC announced Carell would be leaving the series earlier than expected, with four episodes to go before the season finale. Carell has said he plans to focus on his film career. News of Gervais’ cameo comes days after the British comic received a mixed review for his second straight hosting of the Golden Globes. Fellow comedians, the conservative blogosphere, and some actors praised his send-up of Hollywood and biting jokes directed at Charlie Sheen, scientologists, Hugh Hefner, Tim Allen, Robert Downey Jr. and Bruce Willis, among others. But a member of the Hollywood Foreign Press Association, which sponsored the awards show, told PopEater afterward the group had fielded complaints from celebrity reps.
"He definitely crossed the line," HFPA President Phillip Berk added to The Hollywood Reporter. "And some of the things were totally unacceptable. But that's Ricky."